Ronald Frank Harris was the son of Frank and Kate Harris (nee Shorter), and was born at North Weston, Thame on 4th September 1913. He was educated at Shabbington School, and on leaving was employed in Thame, as a counter-hand, by Mr G Bailey, grocer of Buttermarket. On 3rd August 1940 he married Mabel Gladys Newitt at St Mary’s church, Thame. They lived with her parents at 60 Wellington Street, Thame. Ronald joined the Oxford and Bucks Light Infantry at the start of World War 2 and served with the 2nd Battalion initially on Home Defence duties. In early 1942 they became the 2nd (Airborne) Battalion and trained as glider borne infantry, as such they remained in England in readiness for the invasion of mainland Europe, taking part on D-Day to successfully take the Canal Bridge at Caen that became famous as Pegasus Bridge. The battalion returned to France in December 1944 as part of the defence against the German Ardennes offensive. 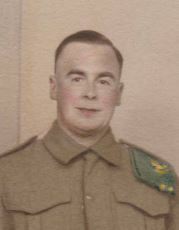 After a short spell of leave, Ronald returned to the battalion for the airborne assault in crossing the Rhine in late March 1945. Advancing into Germany, L/Cpl Ronald Frank Harris died on 5th April 1945, of wounds received during fighting in villages around the town of Petershagen, near Hanover and was initially buried in Friedwalde Evangelist Churchyard near Minden. 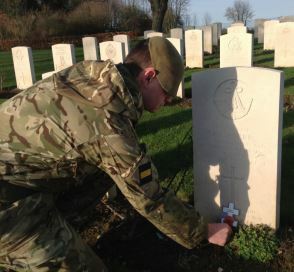 5385941 Lance Corporal Ronald Frank Harris, Oxford and Bucks Light Infantry was reburied in Hanover War Cemetery in July 1947. He is commemorated in Thame on St Mary’s Church memorial board and his name is to be added to Thame war memorial.